Human machine interface (HMI) solutions have made rapid strides in the last decade in step with changing customer demands. As the trend towards real-time factory intelligence gains widespread acceptance in industries, HMI software will continue to evolve. From merely providing plant data on a mobile device, HMI now delivers real-time data and actionable insights to operators. The consequent benefits, such as lower plant operation costs, higher process efficiency, and greater energy efficiency will power the adoption of HMI solutions. 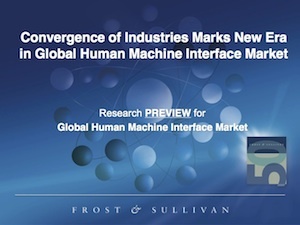 New analysis from Frost & Sullivan, Global Human Machine Interface Market, finds that the market earned revenues of $2.94 billion in 2014 and estimates this to reach $3.60 billion in 2018. Unlike discrete industries, process industries such as chemicals, food and oil can get by with basic automation solutions for production in bulk quantities. Hence, advanced HMI solutions have found restricted use in the process sector. While this trend continues to pervade several process industries, the food and beverage sector is gradually giving in to the allure of HMI solutions. Manufacturers in this increasingly competitive segment have understood that automation is critical in order to remain profitable. Likewise, growing awareness in other process sectors will open up new applications for HMI solutions. You are currently browsing the archives for the HMI category.